Peacefully resting in the quiet waters of Wolf Bay, just South of the Magnusson Park boat launch, is a picturesque wood-hulled wreck. 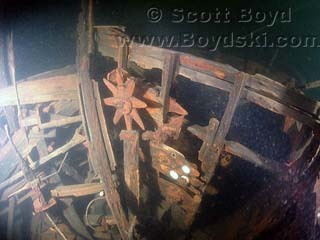 The single screw vessel still has the spokes of its wood steering wheel attached to helm with a few engine gauges nearby. The bent and battered propeller can be found just forward of the rudder, proof that a careless helmsman ran this once dashing yacht into shallow waters. The wood handrails along the forward deck look hand-carved and remind divers of the fine craftsmanship that once graced the old wood steamers that are found scattered along the bottom of Lake Washington. 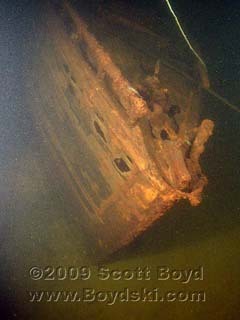 Judging from the location of the wreck, it was likely anchored in Wolf Bay and sank due to neglect many, many years ago. 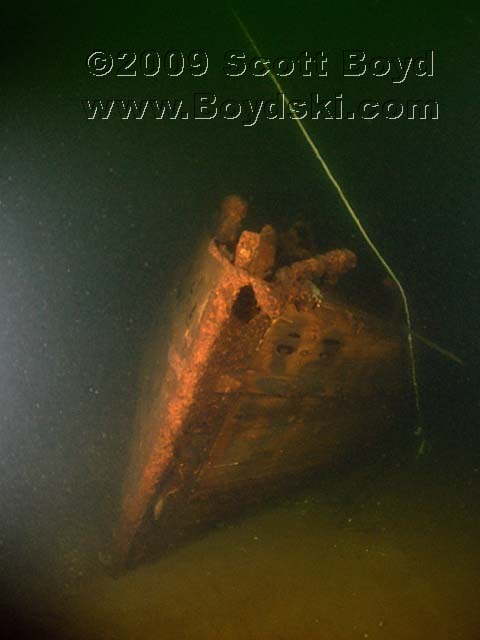 This makes a very nice dive for recreational divers getting their first taste of diving the many wrecks throughout Lake Washington. The majority of the really impressive wrecks are fairly deep and fairly dark, lying in the murky waters in the middle of lake. The easy access to this site from Magnusson Park should make it a favorite for local divers.